Available from Press Shop Automation, the link motion mechanism of the C-Frame double crank link press is able to decrease the speed of the slide down stroke that in turn reduces vibration and tool impact noise. 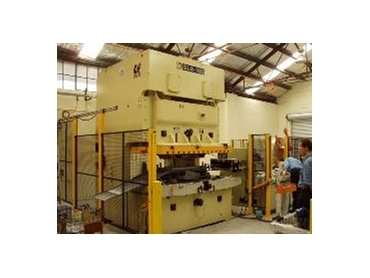 This function also provides improved working conditions for users of the double crank link press. Productivity with the C-Frame double crank link press is increased from 20% to 40% when compared to traditional crank presses. The C-Frame double crank link press has the following standard features a convenient die cushion installation and extra long, precision, six-point gibbings. A rigid steel frame, hydraulic overload protector and high driving torque wet clutch and brake are also featured as standard with the C-Frame double crank link press.